Oh man, I always get so excited when I do a GATRA review! How many deviations will we make? How few people will use the route? Well, the Medway T Shuttle makes no deviations…and gets lots of people. Huh. We didn’t even touch downtown Norfolk, running straight up Rockwood Road through a residential area. It certainly wasn’t urban, but the houses were closer together here than they would eventually become. 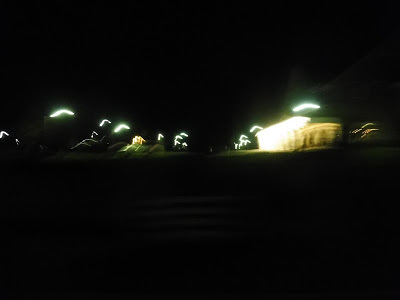 After going under some pylons, the road curved past a housing development, but it got no ridership – we were sailing past everything. Once we entered Millis, the road became Norfolk Road, and there started to be long sections of woods. We went over a tiny unimportant creek, and…wait, that’s the Charles River? Okay, we went over the “mighty” Charles River before turning onto the very narrow Baltimore Street, a residential road. I think we’re making a turn here? Finally, we arrived at Medway Village, the center of town. Truly, this was the heart of civilization…featuring a pizza shop, two churches, an auto shop, a post office, and a town hall. Well, regardless of its small size, a few people got off here. There we go! It’s a legible image! After Medway Village, we merged onto Holliston Street, which quickly became just houses again. We took it up to the Medway Middle School, the route’s final stop. Well, that’s a strange place to end it, isn’t it? 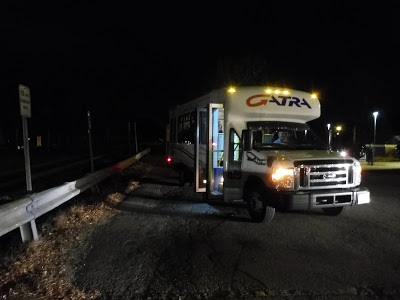 No, not really, as it turns out – GATRA has a nice park-and-ride here, and though it’s in bad shape, it works fine. We merged onto Myrtle Street and came across a set of pylons going across the road. I was all set to go under them, but Nathan had second thoughts. “Let me just shine my flashlight to see where we’re going,” he said as he turned it on from his phone…and right in our path were downed power lines. Right there. We could’ve died!!!! A small bridge over the Charles River actually had a sidewalk, then we arrived at a strange ice arena in the middle of nowhere. “Left here,” Nathan said. We turned onto Dean Street, but we ran into an obstacle in the form of a house with demonic Christmas lawn ornaments outside. After darting between the abominable snowman from Rudolph, a huge Minion from Despicable Me, and a strange cutout of Buddy the Elf, we had to cross the power lines again. Nathan immediately turned on the flashlight. As we were going through the maze of lawn ornaments again, I said a little too loudly that they were awful and creepy. “Don’t say that,” Nathan said, “We might get shot.” Right after, the door of the house opened up behind us and someone started to step out. We bolted into the night. Medway Street was the longest section of our walk. It was also the worst street in the history of the universe. Again, there were no sidewalks, but this time the houses and driveways were further apart. Every time we reached one, we instinctively ducked into it in case any harsh headlights from cars came speeding down the road. The weirdest one by far was a big Hummer, decked out in a ton of different lights, speeding down the road far faster than it should’ve been going. Why did it have so many neon lights on it? Why was it going so fast? More Medway Street. Why was this road so long? Shoot, another car is coming, let’s duck into a driveway. 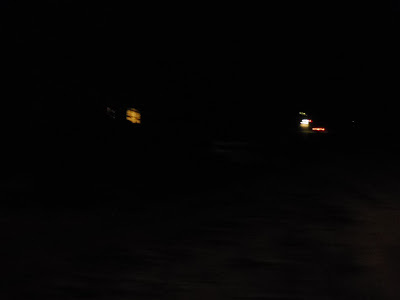 Wait…those lights…that speed…the Hummer was back! I legitimately braced myself for a gunshot…but it never came. 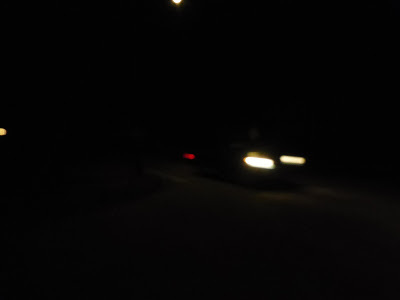 The ghost Hummer sped off for the second time, in the opposite direction. 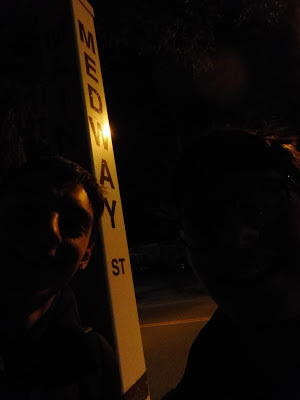 Why did they call Medway Street a “street”? That suggests a relatively urban environment, or perhaps a sidewalk? Medway ROAD would be a much more fitting name. Wait…what’s that down there? Is that…the end? WE MADE IT! WE CONQUERED MEDWAY STREET!!!! I HAD NEVER FELT HAPPIER IN MY LIFE!!!!!!! What wonders awaited us along the uncharted territory of Main Street? A sidewalk? 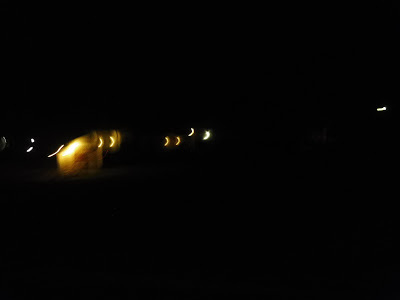 Streetlights? And…civilization! I’ve never been so excited to be in a place as boring as Norfolk Center! We had conquered this horrible walk. We deserved something to eat. 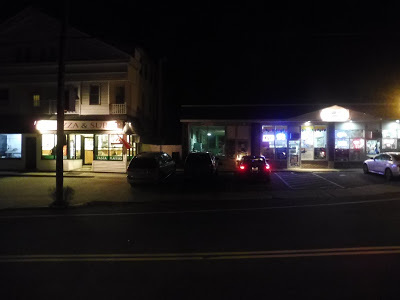 A pungent smell arose as we entered Norfolk Town Pizza. A TV was blaring some trashy game show above the dirty tables. We silently agreed that our orders would be to go. We got our slices in bags, which I thought was a little weird and unwieldy, and once we started eating on the Norfolk Station mini-high platform, it turned out it was plain ol’ bad pizza, too. Sigh…we survived Medway Street for this? Ridership: Well, at first glance, the ridership of 51 people per day doesn’t seem too high. But then you look at the productivity: 36 passengers per hour. Then you see the farebox recovery ratio: 41%, compared to the GATRA average of 8.2%. And finally, we see the subsidy per passenger: $1.30, versus the average of $11.83. Yeah, this is an amazing route for GATRA standards. Pros: Like I said, the numbers for this route are great. This is the best-performing route on GATRA overall, which is quite an achievement. 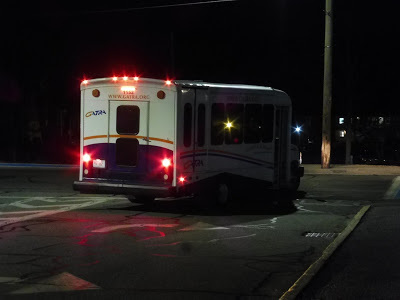 As a route, it gets plenty of ridership on its three trips in each direction, and for only a dollar, this is a great last-mile connection from the train. It’s awesome that it has a free park-and-ride at the middle school, too. Cons: As far as the route goes, its biggest con is in the evening rush schedule. For some reason, the route is shown as departing three minutes before each Commuter Rail train arrives! It obviously doesn’t play out this way, but it could be very confusing for new riders. Also, of all routes for GATRA not to run all day, it’s seriously this one? There are a few shopping plazas out near I-495 that it could run to on a midday schedule, and it would be able to service them every hour. Nearby and Noteworthy: Well, currently, there isn’t much. All you’ve really got is Medway Village, and that’s a very small town center. Of course GATRA’s best-performing route has to get a high score! Now granted, it’s just a rush hour-only commuter shuttle with three trips in each direction, but it still performs that function well. 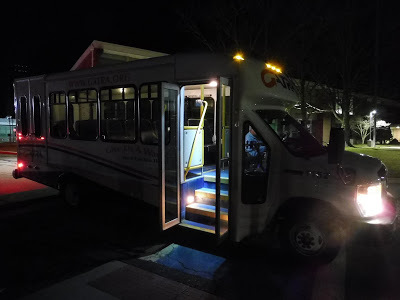 It seems like the route would do well with midday service too, although it only satisfies the shopping mall part of the suburban bus route equation – there are no housing developments to serve, so there may not be a lot of people that would ride middays. Regardless, a bunch of people do during rush hour, and it works great. Also, for the record, Medway Street gets a 1/10, and I hope to never see it ever again.